This is such an exciting day! 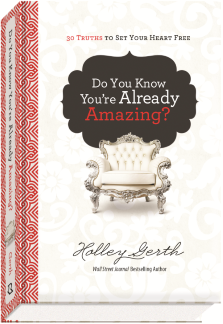 My new devotional Do You Know You’re Already Amazing? 30 Truths to Set Your Heart Free is officially out and I’m thrilled to share it with you. I truly believe it will help set your heart free from the lies you’re tempted to believe. Why? Because that’s what writing it did for me! Do You Know You’re Already Amazing? is a sister book to the Wall Street Journal bestseller You’re Already Amazing but it’s all new content. We belong to a Savior who promised, “You will know the truth, and the truth will set you free” (John 8:32). How do we discover this truth? Through an intimate relationship with Jesus, the One who is “the way and the truth and the life” (John 14:6). Here’s the secret: Truth is not just a fact we store in our heads. Truth is a Person we seek with our hearts. We do so by spending intentional time with Him and hearing what He has to say. Psalm 139:14 declares, “I praise you because you made me in an amazing and wonderful way.” In other words, recognizing the truth about who we are leads to praise not to pride. Honoring our Maker is the ultimate goal of what we’re doing together. We may have been wounded by lies, but we have not lost the battle. And we have been promised victory. We’re going to defeat discouragement, banish fear, and break free from all that’s been keeping us from embracing who we are and becoming all God created us to be. Let’s win this war for our hearts together, sisters. You can order your copy right now, right here! 19 Comments Filed Under: Coffee for Your Heart, Courage, Do You Know You're Already Amazing? Holley I loved this little video!!! I haven’t read the first one but these are both on my list to get soon. When I found your blog it was like I found a friend, accepted as is and who knew what was running through my head and heart. Your words always encourage and uplift me, for that I am grateful. I am praying for you friend. Love and hugs, congrats on the release~I pray it finds its way into the arms of the ones who need it most. Congratulations on the new book! I know it will be a blessing to many just as your sweet and gentle words here are. Thanks for hosting each week! Holley, every blessing to you and your team as yet another collection of uplifting words is released into the world! Holley- I loved the video. it made me smile! Can’t wait to check out the devotional! Huge congratulations on the book! It sounds like such a powerful topic too. I’m excited to check it out! Congratulations, dear Holley! You ARE (already and forever) amazing! May God continue to press that on your heart and the hearts of your readers and listeners. So fab! Got my notice that mine is on the way! ! And, He is the Promise Keeper of all promise keepers! Thank you for hosting the weekly linkup. Congratulations on another book that will be such a blessing and help to others! Congratulations on your devotional! What an exciting time in your life! I just received my devotional, “You already Know you are Amazing”, I am also reading the same book. All I can say, is thank you for reminding me, I truly do matter. I have grown boys, sometimes, I feel I don’t matter to them or anyone else in my life, please don’t take this as a pity party, but I DO KNOW, GOD has always loved me, so when I look into everyday, I pray to our father, and put the day in HIS hands. Thank you for a strong encouragement words that you are doing as a writer for God’s promises to show His truth for every woman who believe and know that are already amazing!